In his years as a Time Lord, Doctor Who (Matt Smith) has travelled to the destructive and dark days of war-torn Britain many a time, and in this year’s festive episode, which airs at 7pm on Christmas Day, and is entitled The Doctor, The Widow and the Wardrobe, He turns up in Dorset in south west England in 1941, where he makes his temporary home in a drafty old house, and welcomes a recently widowed mother named Madge Arwell (Claire Skinner)and her two children Lily and Cyril, who have been evacuated from London to the countryside in order to escape the war. However Madge is hiding a secret, she hasn’t told her children, Lily and Cyril, that their father has died flying his bomber home over the channel, because she doesn’t want Christmas to become the day that broke their hearts. 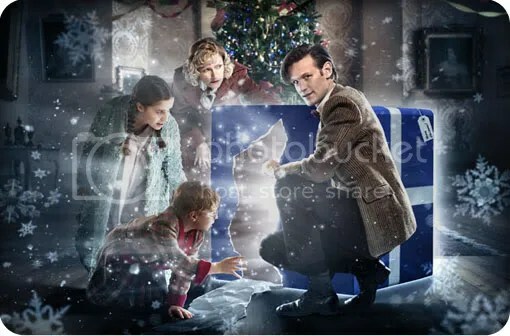 There is also a mysterious blue parcel which has appeared under the Christmas tree, and Curious to see What could be inside, Cyril decides to investigate further and this leads them on an adventure in a magical land where they encounter wooden men and human spacemen, played by comedian Bill Bailey and actress Arabella Weir, and soon find themselves facing a battle for survival. The episode does not feature The Doctor’s companion Amy Pond, played by Karen Gillian, who recently announced she would be leaving the show during the next series, however, we will see a lot of Amy before The flame-haired actress and her on-screen husband Rory (Arthur Darvill) meet a ‘heart-breaking end’ and exit the hit BBC1 show. The founding member of the alternative rock group R.E.M. Michael Edward “Mike” Mills was born on this day December 17, 1958 in Orange County, California). Though known primarily as a bass guitarist, backing vocalist, and pianist, his musical repertoire also includes keyboards, guitar, and percussion instruments, and has contributed to many of the band’s musical compositions. As a young boy, Mills moved with his family to Macon, Georgia and attended Northeast High School in the early 1970s. Mills’ father Frank was a singer whose appearances included The Ed Sullivan Show, while his mother Adora was a piano teacher, which helped him develop a love of music at an early age. He met and formed a band with drummer friend Bill Berry in high school. later, While attending the University of Georgia they also met Peter Buck and Michael Stipe and the four of them decided to form a band together. Mills, Berry, Buck, and Stipe then decided to drop out of college and focus on their band, now named R.E.M. The band quickly developed a following and were soon signed to I.R.S. Records. Mills is credited with being the chief composer behind many of R.E.M.’s songs, including “Nightswimming”, “Find the River”, “At My Most Beautiful”, “Why Not Smile”, “Let Me In”, “Wendell Gee”, “(Don’t Go Back To) Rockville”, “Beat a Drum”, “Be Mine” and “What’s the Frequency, Kenneth?”. In particular, R.E.M.’s 2004 album Around the Sun was heavily shaped by Mills’ piano and keyboard contributions. Mills is also responsible for the prominent backing vocal and harmony parts found within the band’s back catalogue, with his vocal contributions arguably being most noticeable on 1986’s Lifes Rich Pageant and 2008’s Accelerate. In addition to providing backing melodies, he has also sung lead vocals on the songs “Texarkana”, “Near Wild Heaven”, The Clique cover “Superman” and The Troggs cover “Love is All Around”. Mills also recorded a brief piano part for the song “Soma” from The Smashing Pumpkins’ 1993 album Siamese Dream, which was recorded in Georgia. Mills is also known for his collection of Nudie suits, which he often wears on stage, these are named after a Russian-born American tailor named Nudie Cohn who designed decorative rhinestone-covered suits, known popularly as “Nudie Suits”, and other elaborate outfits for some of the most famous celebrities of his era. Mills was first seen wearing one of these suits in the 1994 video for “What’s the Frequency, Kenneth?” and then throughout the band’s subsequent 1995 tour.